The RAF have carried out aid drops of high-factor sun cream to ensure ginger tourists in Sharm el-Sheikh are protected from the sun until they can be brought home. EasyJet has apologised after it emerged that the supposed UK militants killed by a drone attack in Syria this week were merely on a stag do in the Czech Republic, and had just landed at the airline’s ‘South Prague’ airport, which happens to be near the Syrian/Lebanese border. The rolling, once-fertile Hawran Plateau south of Damascus might seem a strange choice for those heading to Eastern Europe, but the airline was adamant that customers are well aware that some of the airports on its routes involve a coach transfer to their final destination. A man has said he is disappointed, upset and overall confused at the new charges on his recent mobile phone bill. The new fees included excess baggage, extra legroom and a large fee for paying his bill by credit card. 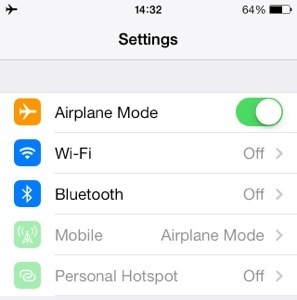 “I called my provider and they confirmed the new charges were a result of me putting my phone into ‘airplane mode’,” he told us. 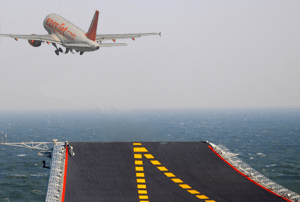 Britain’s airport capacity problem could finally be solved, if an experimental launch of an EasyJet airliner from HMS Prince of Wales proves a success. Head of defence staff Nicholas Houghton insisted that commercial flights between aircraft carriers would allow runways to be moved if there were complaints, and save everyone the bother of having to drive to London. The General pointed out that building ‘just a dozen or so’ new aircraft carriers would serve as a warning to rogue nations that armies of obnoxious tourists could be deployed anywhere in the world. Using a modified launch ramp that can handle 300 passengers and up to 15 tonnes of duty-free, HMS Prince of Wales can now launch holiday makers with less than 40 seconds warning. Houghton admitted that passengers would need to adapt slightly before they use the new facility. “It’s a simple matter of taking the Queen’s shilling”, he explained. “We’re talking about less than 18 weeks basic training, learning how to hold your rum and then swimming a width wearing pyjamas”, he explained. A spokesman from EasyJet pointed out that the mobility of aircraft carriers might occasionally mean a last-minute change in destination. Passengers on the first trial spoke of some difficulties, particularly as the location of their departure aircraft carrier was a closely guarded secret.